Dog Breeds Good Dogs Do Not Bite Children, or Do They? This post could save lives both children and pets. I truly enjoy dog and baby funny videos. This important post entitled “Dog Breeds Good Dogs Don’t Bite Children, or Do They” serves to inform all of us with kids, grand kids and dogs: Good Dogs. Some of you may say “well that’s just common sense” but I suspect that most of us will be surprised at how much good sense this information makes. Judging by the amount of dog and baby videos I see on YouTube I think there are lots of folks that need to get this point of view. My Cavalier King Charles Spaniel love the grand kids but, she will say hello then go to her bed or somewhere they kids can’t easily get to her. I do not allow them to pull hair or any other action that may seem unkind to me or to my dog. I do this out of safety for my grands and out of respect for my dog and her own space. Good Dogs Don’t Bite Children, Do They? 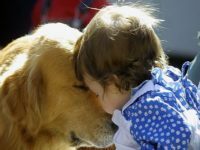 Have you ever beamed with pride seeing your dog do so well with children? Great! This one is for you and your wonderful dog! Historical bite statistics project that over 50% of our children will be bitten by dogs before age twelve, most often by a dog they know. Despite the fact that dog bites rarely cause serious injury, families are distraught and dogs often lose their homes, or even their lives. knew my dog was dangerous and I just let the kids play with him anyway.”? Instead, the calls usually start off with, “The bite came out of the blue! He was always so good with the baby,” followed by a list of all the various things the dog has put up with without apparent complaint. This is a clear case of The Curse of a Good Dog. Most dogs known to be uncomfortable with small children are treated with caution and, thus, protected. It’s the “good dogs” that are generally left to fend for themselves. We all know how this happens. A small child does something with the dog and the dog does not object. Parents think, “What a good dog!” and are lulled into a false sense of security and a resultant lack of vigilance in guiding dog and child interactions. What we forget is that all dogs, even good dogs, have limits to their tolerance. Every action by a child that surprises, frightens, annoys, hurts or otherwise bothers a dog is, essentially, a withdrawal from that “bank account” of goodwill. At some point this balance dips low, maybe on a bad day or maybe after an on-going history of incursions. Bam! That’s when you see the growl or snap or bite. Didn’t come out of the blue at all. Never forget that the Curse of a Good Dog has serious implications for the child, as well. The child is acquiring unsafe habits of behavior around all dogs, not just this particular dog. Most dogs actively dislike hugs, kisses, kids pushing them, pulling their fur or disturbing them while they’re sleeping — even if your own good dog has yet to object. What your child does with your dog she will do with other dogs. • Actively seek out opportunities to turn withdrawals into deposits. Sure, all kids do some things that are annoying to dogs. Your job is to make it worth your dog’s while. Look at your dog, praise him and give him a treat. Every time. This increases your dog’s store of tolerance and prompts him to look to you when disturbed or startled. It should never be your dog’s job to “correct” your child. Show your dog that you will make it OK for him. • Learn the body language of a worried dog and contrast with how your dog looks when happy or relaxed. Unless you’ve got a suggestion box where your dog can write you a note and stamp it with a paw print, body language is all your dog has. Luckily, once you know what to look for, you can’t miss what your dog is telling you. • Teach your children true respect and empathy for animals by clearly supporting the animal’s likes and dislikes. If your child truly loves your dog, she’s got to show that love in a way the animal truly appreciates. Dogs love children they can feel safe around. Save the hugs and kisses for Grandma. • Oddly enough, we get to have our happily ever after with our dogs and kids when we stop assuming a “good dog” is the most important part of the equation. There you have it “Dog Breeds Good Dogs Don’t Bite Children, or Do They?” It is meant to get you thinking. I hope we were successful. I have found that a good dog crate can be of assistance when kids and company are around and after this post I am even more convinced that where there’s a dog there should also be a dog crate for those times when nothing else will do. Lock them in the bedroom they dig at your carpet. The dog crate lets them stay with the family, their pack while doing so in safety. Very important. Yes Karen I agree completely. I see far too many folks with far too much faith in their wonderful dogs that they won’t ever bite their child, misplaced faith I suspect. Appreciate your comment. All dogs have the potential to bite. You need to watch the interaction and yes the children need to learn how to interact with a dog. Having a place they can retreat to is important also. Perfect Kennel or some kind of Dog Crate is important. Read the signs. Responsible dog owners area the good dog owners. Thanks sincerely for a great article. dogcollarsandtoys.com has some of these carriers and dog crates. Hi Lynn, thanks so much for your comment. Yes I agree, a little knowledge and attention goes a long way in keeping kids and dogs both safe. I must admit that I’m running behind in keeping up with what you have going on over at http://lynnbaber.net/ also I did read perhaps your latest article over at Ezine and plan to put it on my horse blog really soon. Thanks again and all the best to you. How is Amazing Grays – Amazing Grace doing? What an excellent article. Is some ways dogs are very similar to horses, especially when it comes to leadership and who is ultimately responsible – YOU! Wonderful points that will help make life wonderful for both kids and dogs. The author’s understanding of both dog and kid psychology is on-point and refreshing. This information can help prevent children from becoming afraid of dogs and an innocent dog from blame it does not deserve.